The driving approval and driving state control of the DC-DC converter are performed by the EV-ECU. 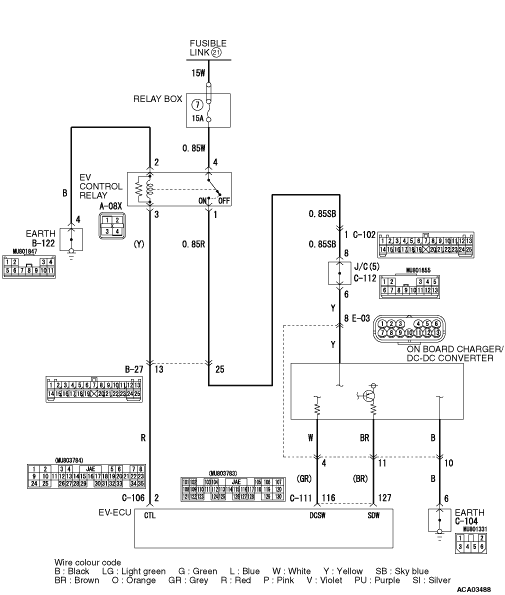 When the DC-DC converter drive stop state continues for 4 seconds or longer while the DC-DC converter driving approval is underway, the diagnosis code No. P0A09 will be set. When the malfunction of the system cooling system or control voltage trouble is recorded as a past trouble, the diagnosis code may be set. Check the code. Conduct the actuator test (item 03: Water pump drive, item 04: Radiator fan 1 drive, item 05: Radiator fan 2 drive) to check the cooling system. Visually check the radiator core. Check the EMCU diagnosis code. When the total battery voltage is around the low voltage limit, MCU may determine that a malfunction has occurred (not a malfunction). Q. Is the check result normal? Charge the main battery. Then go to Step 10. STEP 2. Measure the voltage at E-03 on board charger/DC-DC converter connector. (1)Disconnect the E-03 on board charger/DC-DC converter connector, and measure the voltage at the wiring harness side. (2)Turn the electric motor switch to the "ON" position. (3)Measure the voltage between the E-03 on board charger/DC-DC converter connector terminal No. 8 and the body earth. Repair the damaged connector. Or, correct or replace the relay box. STEP 4. 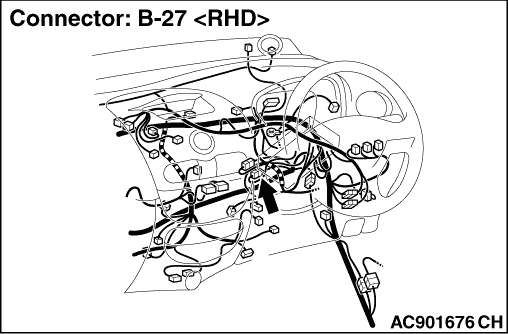 Check the wiring harness between A-08X EV control relay (relay box) connector terminal No. 1 and E-03 on board charger/DC-DC converter connector terminal No. 8. Check the power supply line for open circuit. STEP 6. Check the wiring harness between E-03 on board charger/DC-DC converter connector terminal No. 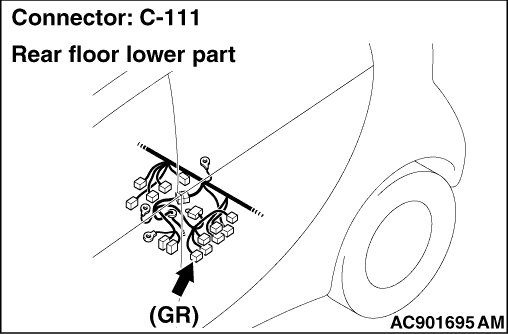 4, 11 and C-111 EV-ECU connector terminal No. 116, 127. Check the signal lines for open circuit. STEP 7. Check the wiring harness between E-03 on board charger/DC-DC converter connector terminal No. 10 and the earth. Check the earth line for open circuit. 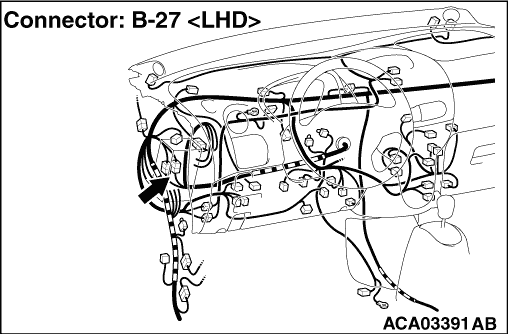 With the connector connected, apply 12 V to the C-111 EV-ECU connector terminal No. 116. Set the electric motor switch from the "LOCK" (OFF) position to the "ON", "START" position. OK: The auxiliary battery charging warning lamp goes out. Replace the on board charger/DC-DC converter. (Refer to .) Then go to Step 10. 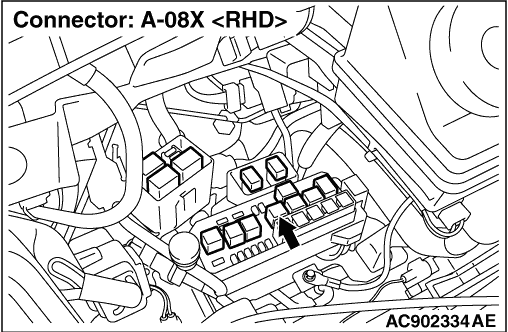 Check again if the diagnosis code is set to the EV-ECU. (1)Erase the stored diagnosis code. 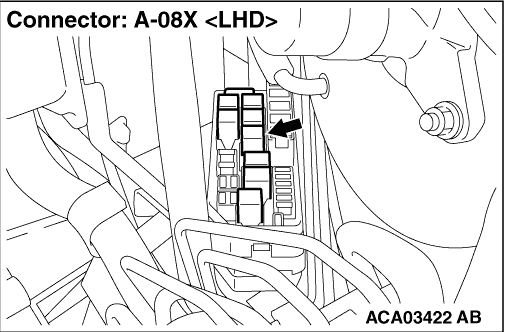 (2)Set the electric motor switch from the "LOCK" (OFF) position to the "ON" position. (3)Check if the diagnosis code is set. Q. Is the diagnosis code set? 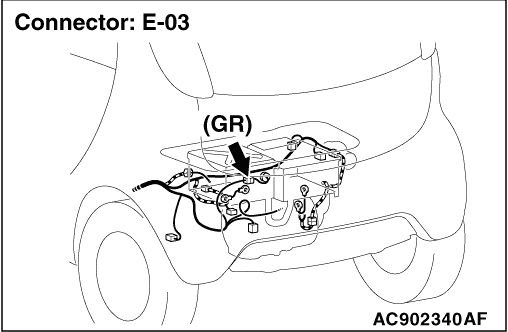 Replace the EV-ECU. (Refer to .) Then go to Step 10.